Stafford Kid is current album Blu Sykes Saffire came out November 15 2015 with 12 pieces. which will include Santia's Starlight Stafford Kid's two times Festival winner and the piece she wrote in memory of a good friend. Her music has been used on Youtube.com by Guide Dogs for the Blind, for their puppy videos. Also they been using her music in their kennels to help keep the valuable dogs calm. on June 30,2016 Stafford Kid piece from her album , Dance of the Fox won for Best Original Soundtrack at Canadian Diversity Film Festival. On September 30 another award was given to Stafford Kid at the Chandler International Film Festival, Chandler Arizona. 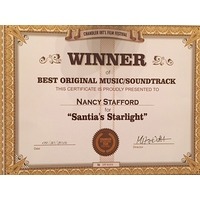 Santia's Starlight won an award for Best Original Soundtrack/Music. On November 30 Stafford Kid piece Santia's Starlight won yet another festival award from Canadian Diversity Film Festival for Best Original Music/Soundtrack. Stafford Kid is a three Film and Music Festival winner, and been nominated 7 times from other festivals, she also was award two special awards for two pieces from Blu Sykes Saffire album, Dance of the Fox and Dream On World View Music and Film Festival for excellence.